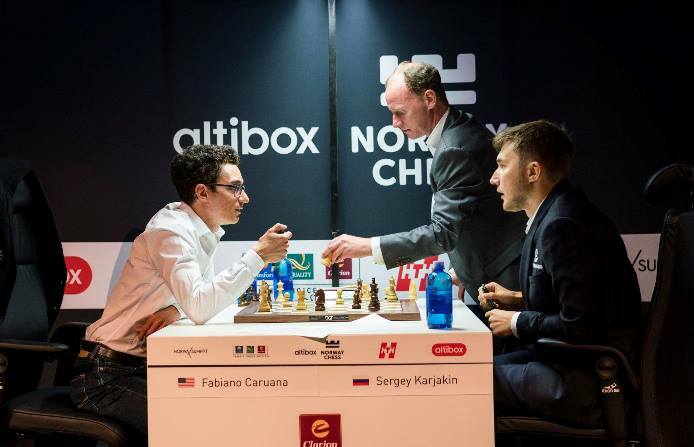 Fabiano Caruana beat Sergey Karjakin in Altibox Norway Chess Round 5 to return to 50% while dragging his opponent down to the same level. 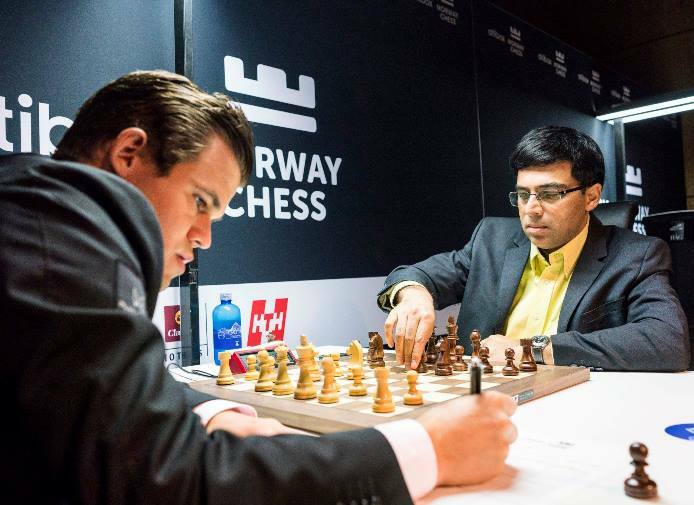 That was good news for Magnus Carlsen, whose somewhat shaky draw against Vishy Anand meant he restored a one-point lead, since Mamedyarov-Nakamura and MVL-Aronian also ended in relatively uneventful draws. Ding Liren is out of the event after understandably deciding he needs to focus on recovering from hip surgery. Let’s first take a look at the draws in the order in which the players shuffled into the commentary room to explain themselves. First up were Shakhriyar Mamedyarov and Hikaru Nakamura, who served up a dish of Candidates Tournament leftovers. Shak played the 4.Qc2 Nimzo-Indian, as he had against Magnus in Wijk aan Zee, against Aronian and So in the Berlin Candidates and against Karjakin in Shamkir Chess. All those games had ended in draws, and Jan Gustafsson wondered if the opening really suits Mamedyarov’s chess strengths. 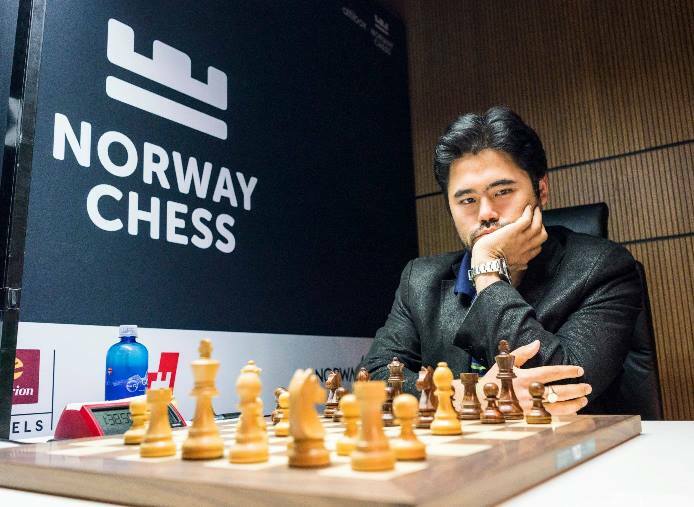 Shak said he’d prepared the line that occurred in the game for the Candidates, but it turned out Hikaru Nakamura had as well – just for the 2016 Candidates in Moscow! Otherwise he might have hesitated before playing 16...g5! Shak said he was surprised by that “strong move”, and concluded, “he understands everything - for me it’s better to make a draw and go to sleep!” He’d been talking previously about how his toothache had gone but he’s now having issues with sleeping too much. 17.Nxg5 is playable, but just a draw, and there was also just a draw in the game after 17.Bg3 Qxc5 18.Qd8+ Kg7 19.Be5 Qc1+ 20.Ke2 Qc4+ and perpetual check. The players shook hands after 24 moves. I need to apologise to my helpers. It doesn’t matter if they do a good or a bad job if I don’t remember the lines I had on the computer this morning… I knew basically all the candidate moves, but I couldn’t remember which is good! 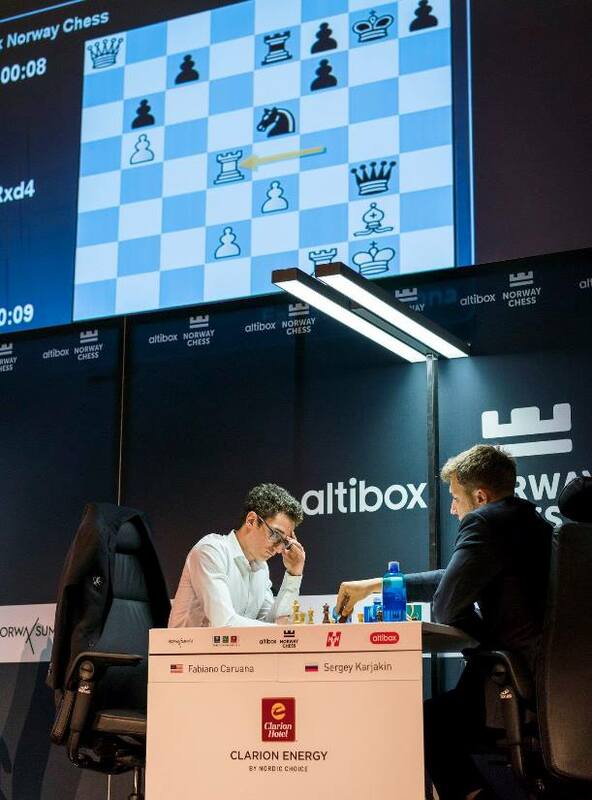 Maxime’s dream scenario here would be for Aronian to blunder with 21…Ba6? 22.c4!, when the threat of 23.Bc3 is no laughing matter. That was spotted by Jan and Peter commentating and also by the players, who instead repeated moves with 21…Nc8 22.Rd2 Nb6 23.Rd6 and so on. I have to play some unnatural moves, which is a bad idea against such a talented natural player as Maxime. The black breakthrough did follow with 9.Bd2 Qh5 10.Be2 d5, but after 11.cxd5 exd5 12.exd5 Nxd5 13.0-0 Vishy saw something he disliked in the mass exchanges that would follow 13…Rd8 14.Nd4 Nxc3 and, in his words, “blundered” 13…Nf6?! It’s exactly his type of position. Of all the guys to get this position, why do I do it today? Luckily those somewhat underwhelming draws were just the warm-up act for the main game of the day. 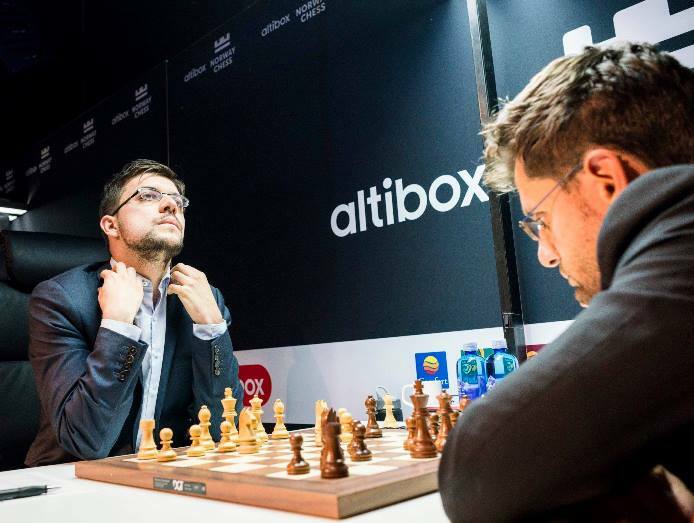 Sergey Karjakin dashed Caruana’s hopes in the final round of the 2016 Candidates Tournament, and he almost repeated the trick earlier this year in Berlin when he beat Caruana to take the lead with just two rounds to go. 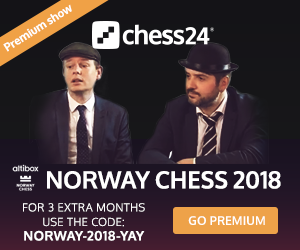 Karjakin was on a roll there, and it seemed he might also be building up momentum in Stavanger after his win over MVL. In Round 5, however, he suffered an almost complete reversal of fortune. While Karjakin had come armed with an opening surprise against MVL this time it was Fabiano who went for the deceptively innocuous-looking 7.b3. To see the kind of madness that can ensue check out one of its most recent outings when Wouter Spoelman took on Lev Yankelevich in a wild Bundesliga game earlier this year. Spoelman didn’t think for over a minute on any move until he had a winning position by move 15. Sergey spent 15 minutes and played not Yankelevich’s 7…d5 but 7…0-0, after which he seemed to get stuck in two minds. On the one hand he went for 10…b6, which Fabiano criticised as too slow, while on the other he then played some hyper-aggressive moves until he’d planted his queen on g3. This was a key position that arose after 19…Nf6!? I didn’t think I was forced to take, but I thought, if I don’t take and he equalises, I’ll really regret it! There’s plenty of potential in the other games, though, with Aronian-Caruana, Nakamura-MVL and Anand-Mamedyarov all heavyweight clashes. 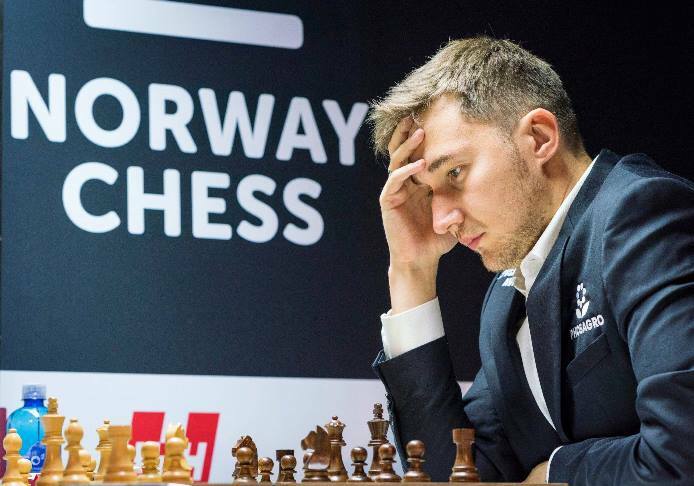 Sergey Karjakin will have two rest days before he gets a chance to bounce back, since he was paired to play Ding Liren on Sunday and Monday is the final rest day for all the players.